The first SCS figurine in the Fabulous Creature trilogy was the Swarovski Unicorn. Like some of the previous trilogies, Swarovski offered an optional display stand for 1996 AE crystal figurine as well. The Fabulous Creatures Unicorn stand measures 6” in length. It originally retailed for $45. 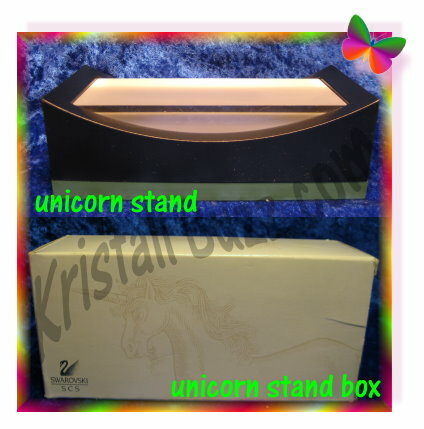 The Unicorn Stand Box features a line drawing of the Unicorn, so any collector easily confirm when the stand is in the correct box. The Swarovski Unicorn Stand is 2 colors with an opaque plastic piece for the Unicorn base. The remainder of the Unicorn Stand is painted wood: mostly black with a forest green trim along the very bottom edge. Trying to describe it any further would be difficult, so it is best to rely on the picture. The identification # for the Swarovski Unicorn Stand, as established in Warner’s Blue Ribbon Books on Swarovski and recognized by other professional brokers is # DO1X961S. As time has passed, we have notice the black paint peeling or chipping on the corner edges. This is one place in particular that crystal fanatics should look at when buying a SCS Unicorn Stand for their figurine display. At present, there are not many SCS Unicorn Stands available on the secondary market or at auction. Warner’s Blue Ribbon Books recommends an insurance value of $210, based on research done in January 2012. Recent trends on the secondary market indicate trading prices in the $130 – $175. At the online auctions, there were some completed auctions near $50 for stands, and those stands were minus original factory packaging. In summary, the replacement value of the Swarovski Unicorn Stand will vary greatly depending on condition (good paint vs peeling paint) and whether or not original factory packaging is included.